There are several different types of pests that can bother your tomato plants. Beetles are one of those types. You may find blister beetles, Colorado potato beetles, or flea beetles on your tomato plants. These beetles mainly eat the leaves of the tomato plant, leaving behind small and large holes. If you see these beetles, you will want to get rid of them as soon as possible. Pour water in your bucket. Then add the dish soap. This is the base of your homemade insecticidal soap. Drip the vegetable oil and neem oil into your bucket. Mix all of the ingredients. 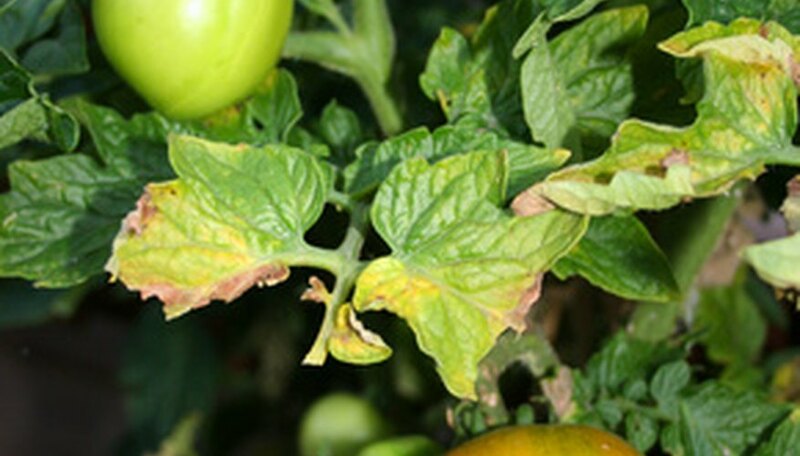 The vegetable oil helps the insecticidal soap stay on the tomato plant, while the neem oil works as an all-natural pesticide to kill the beetles. Transfer your insecticidal soap to an empty spray bottle. Spray your tomato plants with your homemade insecticidal soap. Concentrate on the leaves as this is where you will find most of the beetles. Repeat every four to five days, or after a rainfall. This insecticide will both kill the beetles that are on the tomato plants and keep new beetles from feasting on the leaves. Boric acid is another natural product you could use as an insecticide. You can use chemical insecticides to get rid of the beetles on your tomato plants, but be aware that some of the chemicals may seep in to the plant. When you eat the tomato, you eat the chemicals.